Souls to the Polls takes place this Sunday, October 30, 2-4 p.m. at Holly Plaza. It's a community event, supported by local churches, to encourage early voting. Mayor Anthony Foxx will be on hand along with other dignitaries and local Democratic candidates seeking office or re-election. There will also be music, free food, and WGIV will broadcast live. 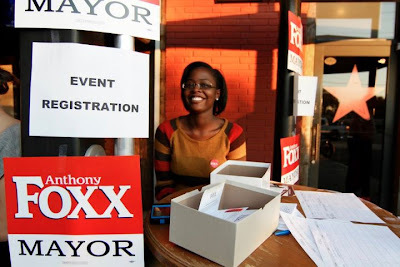 A volunteer at a recent Foxx campaign event. Credit: Meredith Jones/facebook.com/AnthonyFoxx09. Holly Plaza is located on the corner of Holly Street and Beatties Ford Road, next to the Beatties Ford Library, 2300 Beatties Ford Road. This library is one of several locations around Charlotte and Mecklenburg County where you can vote early any day until November 5. The Souls to the Polls event, in particular, will encourage people to vote after attending church service on Sunday. Click here for a list of early voting locations and hours. Election day is November 8. Visit www.meckboe.org for answers to any questions you might have regarding voting in Mecklenburg County. Below is a video of Mayor Foxx greeting voters on the first day of early voting last week.